It's ironic Breathless' central characters, Michel Poiccard (Jean-Paul Belmondo) and Patricia Franchini (Jean Seberg), have such distinct names because in many ways they are ciphers. 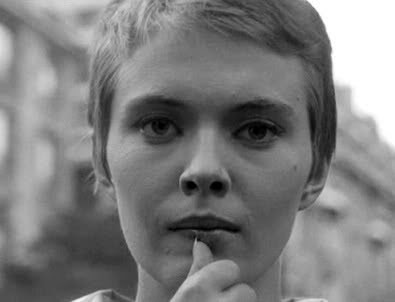 Each is less of a realistic persona and more a representative of a specific iconic type found in cinema: Michel the tough talking rebel recalled by the close-up of a Bogey photograph early in the film; Patricia the lost expatriate beauty, an extension of actress Jean Seberg's real-life seclusion in France when her nascent film career took a dive after being miscast in a couple of Preminger films. Together, Michel and Patricia reflect the tension in this transitional moment for Godard, in which he goes from critic dabbling in short films to full-fledged auteur of the sort even he didn't propose in his writings. Michel stands in for the dark, anarchic impulse of an artist struggling to break free of the restrictions imposed by his limited thinking ancestors. And Patricia symbolizes the pretty Hollywood studio films the artist begins to concede are hollow, traitorous, and hostage to the limitations of their genus. As Michel admits near the end of the film, the young lovers often talk about themselves more often than they talk to each other, neither fully embracing the other. The one instance in which they momentarily connect is when Patricia confesses she may be pregnant with Michel's child, a comment on Hollywood's acquisition of artistic inspiration just before it commercializes it. Patricia tries to place free-spirited Michel in a cage as gilded as the one Godard believes Hollywood ensnares its artists in. It is as if Godard's mind is cleaved in two; one side respectful of the American auteurs he has idolized; the other with a mind to destroy them in order to set off in a new direction. Godard speaks through Michel, but he acts through Patricia. 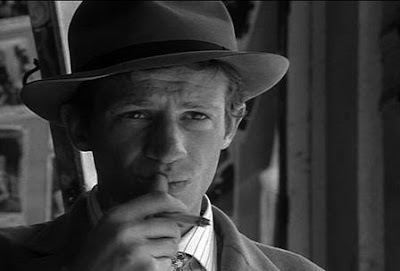 Michel immediately draws us in, the character breaking the fourth wall shortly after he steals his first automobile; Godard creates a complicity with the audience when he places his camera in the front seat of the car, directing Belmondo to speak into the lens. Patricia is more enigmatic. 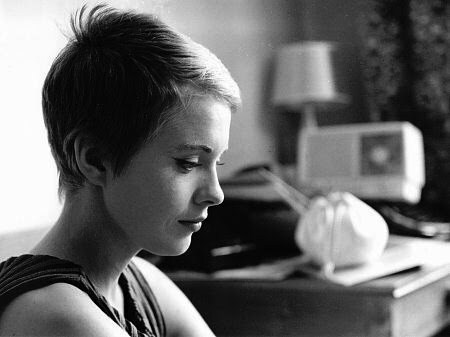 One looks at the beautiful Seberg, but can never truly look into her. Instead, we are forced to reflect on her sometimes unpredictable actions. In a reversal of expectations, Michel, flagrantly disregarding even the most basic societal code of conduct, is the more traditional one; it is he who typically spouts aphorisms, such as "Women will never do in eight seconds what they would gladly agree to in eight days." Patricia is more deceptive, a seeming conformist afraid to do anything that may jeopardize the income she gets from her parents back in the States; she is still evolving, forming into the person she will be, "I don't know if I'm unhappy because I'm not free, or if I'm not free because I'm unhappy." Those words could just as easily be coming from Godard's mouth. As cinematographer Raoul Coutard reveals in a documentary on Criterion's Blu-ray (released just this past Tuesday), Godard was just as likely to shoot an above average amount of scenes in one day as call him in the morning to propose he call their producer and tell him they wouldn't shoot today because the director fell ill from eating a bad slice of pizza. The "jump cut" technique—an innovation which impressed and inspired so many filmmakers who followed him, freeing them from a long established film language—was Godard's simple solution to shortening the film's lengthy running time without eliminating entire scenes. This is not to discredit Godard's pioneering work. It is to reframe his inventiveness as an instinctive grasp of how to break the rules born not out of some calculated desire to do so but out of expediency. That Michel ultimately dies as a result of Patricia's betrayal may serve as a parallel to Godard's submission to commercial demands in Breathless, his first feature. But the last shot of Patricia in which, for the first time, she strokes her upper lip in the same manner Michel does throughout the film, reveals how much of Michel's characteristics she has absorbed. If one allows that Patricia is emblematic of the mainstream Hollywood film and Michel of the reckless artist, then the statement Godard makes is a bold one; he capitulates in this artistic battle, but declares he will emerge victorious in the war. Ultimately—as the recent announcement of an Honorary Academy Award attests to—it is Hollywood which adopted some of Godard's methodology, not the other way around. Compelling write-up, though in some ways one could reverse the roles, with the larger-than-life movie-imitating Michel representative of the genre influences on Godard, and Seberg's ordinary Jo, selling newspapers on the Champs Elysees, as indicative of the anthropological/verite influences on the New Wave - or one Melies, one Lumiere I suppose. But then as you point out, she's American/he's French, she's a famous movie star/he at the time was not, so even within themselves they represent the contradictions inherent in Godard's outlook. I love the way he once described the film: "I set out to make Scarface, but I ended up with Alice in Wonderland." I had no idea the Academy's giving him an honorary Oscar. His response is hilarious and entirely expected. Anyway, he SHOULD stiff them if they plan, like last year, to ignominiously hand them out months beforehand, separate from the broadcast, as if these legends aren't worthy enough to eat up airtime belonging to awkward presentations by the Twilight tots. Disgraceful. Great post Tony. Breathless was one of the turning points in my years as a serious movie lover. On one hand, as you've noted, the movie has its share of mainstream inclinations, while on the other it also started Godard's rebellious journey as a filmmaker. It thus contains a fascinating balance of the status quo & iconoclasm. I especially liked the analogies you've drawn out of the protagonists' characters. One often ends up enjoying a mainstream movie without really liking it, or for that matter appreciate an arthouse movie despite yawning one's way through it. Breathless was one of those rare works that managed to combine the best of both the worlds. MovieMan, I'm not holding my breath concerning Godard's confusing answer to the Academy. They DO deserve to be stiffed, holding the Governor's Awards dinner in November rather than invite the honorees to the Oscar show. Shubhajit, it is an exhilirating film isn't it? There's a dynamism to the tone, setting, performance styles, and more which is rare to find these days. In some ways BREATHLESS is dated, but in others it's still ahead of the times. A personal note on the movie - when I initially saw it (it was my first Godard) and was baffled at its reputation. It seemed so slight and underwhelming. I went on to see and prefer Masculin Feminin and Week End followed by many more Godards in the years to come. Eventually I came around on the film and now like it a good deal, but the turnaround came ironically when I dispensed with the legacy and just approached it as Godard's giddy and heady tribute to the American gangster films he loved (and to all the ideas kicking around in his head). Seeing it purely as a lark helped me enjoy it more and, paradoxically, to appreciate any weightier elements to it as well (first as Scarface, THEN as Alice). Although it's still not one of my favorite Godards, which says as much about how much I love his oeuvre as about the film itself.